One of the fondest memories I have of my dad when I was a kid, was where those rainy nights that we were all lazy to cook in the kitchen and would just stay up late chatting and storytelling. ( Well you know we didn’t had television yet Only real goodness bonding moments to the max. And in the end dad will bring as along with him to Aling Tinay’s Noodle House (A smally eatery opened 24 hours). And there we would slurp her best selling beef noodle soup and eat hot pandesal together. These moments were priceless. A year ago, we went on vacation in Malaysia and there I discovered Mee Sup and its similarity to Filipinos Mami Noodle Soup. It was a delightful discovery rencontre but my palate was still longing for the taste I grew up with. Mami Noodles are noodle soup extensively eaten in Philippines day and night. When I say day and night I truly mean it. Filipino’s eat more than three times a day if we include all those tiny snacks we nibble in between meals. And most of the time the star of this snack time are noodle soup. That is reason why cup noodles that just need to add hot water or boiling water is flourishing. 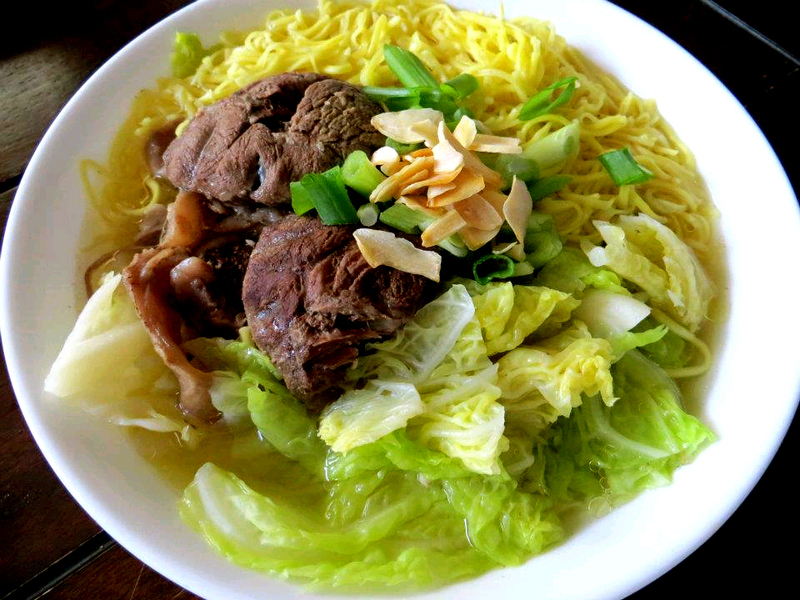 Pinoy Mami Noodles consist of a meat bouillon , yellow colored noodles (miki) and topped with different ingredients. The more toppings there are the more luxurious it is. Enjoy the recipe and have fun putting more toppings on it. * Wash and strain. Boil some water; Once they are boiling dip the noodles to soften them for few seconds. And put them in individual bowl. Beef Broth:* you can prepare this in advance. Buy a good piece of beef with bones, meat and fat on it. Put them in a casserole and fill it up with water. The beef should be submerged in water completely. Add a carrot, onion, celery, peppercorn and rock salt. Boil for an and a half until meat becomes tender. Filter the soup and set aside the meat. Assembly: Put the noodles in their invidual bowl. Add some sliced beef, sliced hard boiled egg, spring onion, fried garlic and veggies. Then pour a ladle of boiling hot beef broth. Grind some pepper on top and add a teaspoon of sesame oil. This one is my favorite. My Dad used to cooked Mami during our college days. How I miss his cooking. I am drooling ! The problem here is I cannot find miki noodles do you know what is the best substitute (that has the same taste of miki) I can find here ? ?